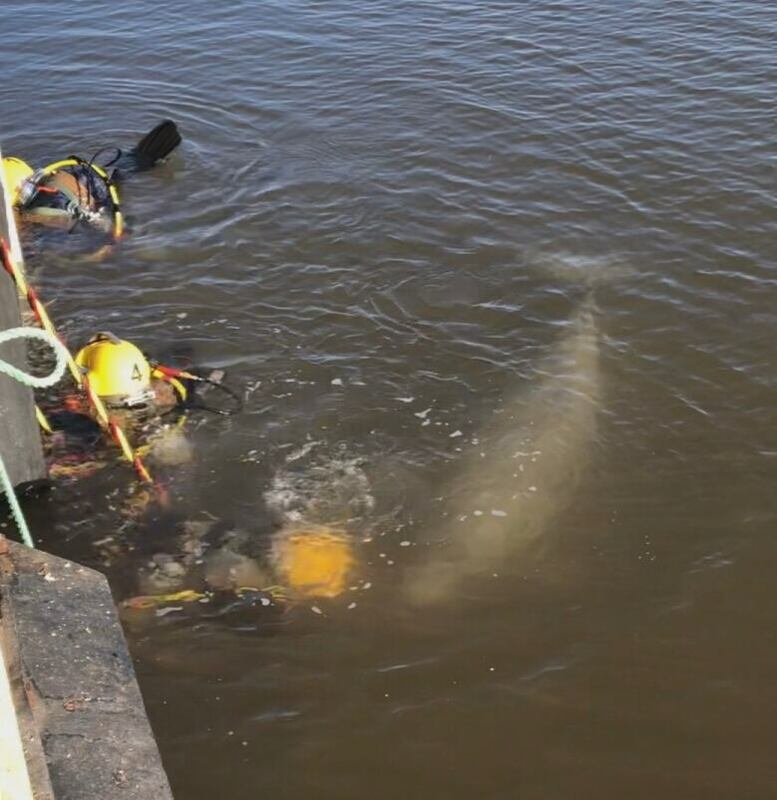 A class of commercial diving students were joined by a beluga whale for a couple of hours during lessons in the Summerside Harbour on Friday morning. 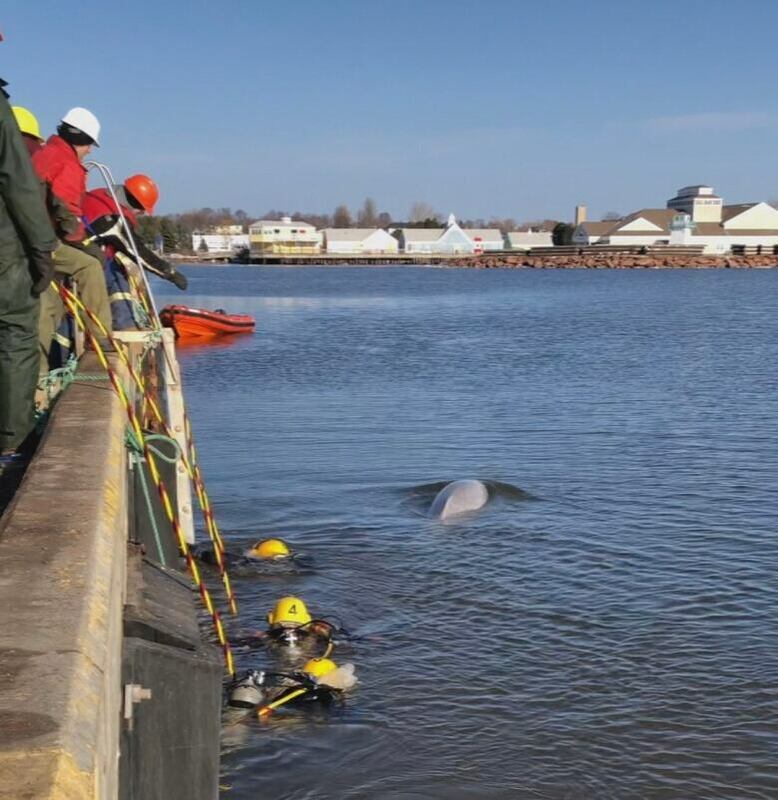 Holland College students taking part in the commercial diving training program made a new friend beneath the waves in Summerside Harbour on Friday — a beluga whale. It was quite the surprise when the divers entered P.E.I. waters and met up with the 3.6 metre long (12 foot) mammal — bigger than the divers it was investigating. "I would say my first reaction was excitement, but I won't lie, I was freaking out," said student Miguel Martinez. "At your back, there is something coming and, well, you are underwater, so you have one foot of visibility and after that you turn around and you see this big eye just close by and looking at you." They were bringing a safety lifeboat over to where they would be diving when the beluga popped up and decided to join the class. The students were learning how to tie knots underwater and working with metal cables. "When you hit the cables, they hear this noise and they approach," Martinez said. "She starts to stare at you and it was like she was trying to understand you." The whale hung around with the first group of divers before swimming off when they exited the water. "Then the second guys, including me, got in the water and there he was," said student Joseph Harvey. "Super friendly, playing with us, playing with the bubbles, super curious ... amazing. There is just no words." 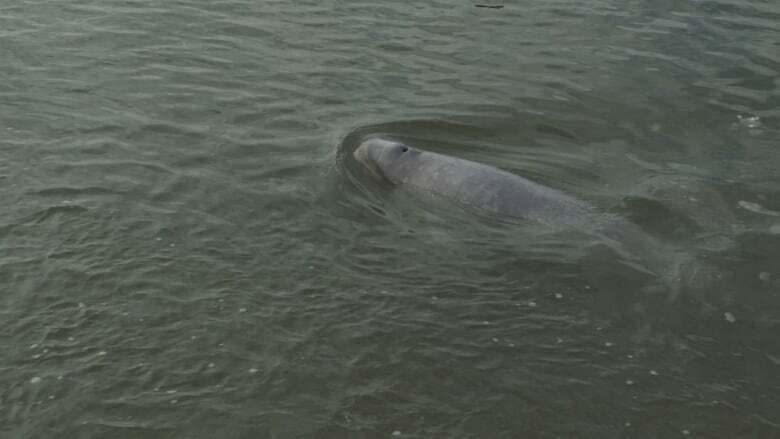 "I have not seen a beluga whale in this harbour before and I have been here a lifetime," said Kimball Johnston, instructor at Holland College's Marine Training Centre. "This time of year, the diving gets a little tougher for the guys. The water is a little colder, they are a little slower getting in. Today, that wasn't an issue. They couldn't wait to get in the water. "They sure took to the whale as much as the whale took to them, I think," Kimball said. "I'm not sure who had more fun, the whale or the divers." Kimball has taught the class at the centre for the past six years with students coming from across North America to attend. The students learn about everything from underwater welding to underwater construction techniques, with a big focus on safety and looking after themselves in the water. When they leave the nine month course in May, they will be certified through the Dive Certification Board of Canada as unrestricted divers — with a whale of tale to tell about their time on Prince Edward Island. "Like I told these guys, you will dive a long time before something special like that ever happens," Kimball said. "I have never personally had that happen to me, these guys are just starting out in their careers. Pretty cool." "We came back with the boat and he was just following us, pushing along with the boat, playing with the boat," said Harvey. "I was just in there and I didn't want to get out, just enjoying every second of it cause it was really unique, beautiful." The beluga hung around until the safety boat was pulled out of the water at the training centre. The students had one more glimpse of the departing whale — a chance for some to be reflective. "Make sure to create some conscience to keep them alive so that everyone can see them," Martinez said. "It's a pretty amazing experience and hopefully for many years we can keep seeing them, so just, conservation."